One of the great strengths of our Institute is its Internal Research (IR) Program, and this article is to a very great degree a story of one of the IR Program's successes. The story begins in 1991. At that time, our Division's space experimentation expertise was based in mass spectroscopy and measurements of plasmas and magnetic fields. These so called situ measurements are the space equivalent of the body's sense of smell. These techniques (reference to the Cassini Tech Today article) provide an extremely powerful tool for studying planetary atmospheres and ionospheres, planetary magnetospheres, and the interplanetary medium. However, they require that the instruments be brought to the place they are investigating. By contrast, space remote sensing, through the use of telescopes and photon detectors, allows one to study objects across great distances. Well, as we just noted, in 1991 our Division was known for its expertise in in situ measurement techniques but was lacking in space remote sensing experience. Because remote sensing offered to open up whole new avenues of scientific research, and research work, we made a deliberate decision to gain experience in and become a center of excellence in space remote sensing. The particular branch of remote sensing we chose was optical and ultraviolet (UV) imaging and spectroscopy, which provides powerful tools for studying planetary atmospheres, comets, and a wide array of astrophysical environments. Because this was already a mature field with many well-established research groups, we knew we would have to demonstrate our abilities internally before we could hope to win projects. So, with those goals in mind, we put together an internal research proposal to develop a versatile, low-cost UV/visible imager that could serve as a prototype miniature astronomical laboratory aboard the Space Shuttle. We called our instrument SWUIS, or the Southwest Ultraviolet Imaging System. Our proposal was accepted in mid-1991, and within a little over a year, we had put together a working version of our concept. We proved out the instrument's capabilities in the lab, and then with a field trip to McDonald Observatory in 1992. We then proposed and were accepted to fly SWUIS on a pair of high altitude demonstration missions aboard NASA SR-71/Blackbird aircraft in early 1993 (see photo below). These missions took SWUIS to altitudes of almost 90,000 feet and speeds exceeding Mach 3.2. With the experience we gained from the Internal Research funded-laboratory demonstration, and the high performance aircraft flights, we felt we had a good basis to propose to build up and fly a SWUIS instrument aboard the Shuttle, and to use it to tackle some difficult kinds of remote sensing observations in space. Fortunately, the Universe cooperated, by providing us with Hale-Bopp, the "Comet of the Century." Comets are relics from the formation epoch of the solar system, and planetary scientists relish the opportunity to study a bright one. So, when Hale-Bopp was discovered in mid-1995 and it was recognized that when it approached the Sun in mid-1997, it would become one of the brightest comets ever recorded, NASA requested proposals to conduct space observations of this unique comet. Our group proposed to fly SWUIS aboard the Space Shuttle, in order to image the comet from space when the comet was too close to the Sun to risk the Hubble Space Telescope. Scientifically, our goals were to obtain a long, time-lapse series of wide-field images of the comet so its behavior and morphology could be studied in detail. SWUIS presently has two hardware configurations for Space Shuttle missions: 1) telescope science mode (TSM); and 2) camera science mode (CSM). TSM utilizes a telescope for high-spatial resolution imaging of faint object targets such as planets, comets, and space debris. CSM utilizes a wide-field camera lens for imaging bright targets that occupy larger swaths of the sky such as aurora and lightning sprites. Both TSM and CSM hardware are sensitive to ultraviolet (UV), visible (VIS), and infrared (IR) wavelengths. The SWUIS TSM hardware is composed of three major elements: the telescope; the intensified charge-coupled device (ICCD) camera; and the electronics that provides power and control of the ICCD camera. In addition to these major components, SWUIS utilizes a custom built mounting bracket that couples the telescope to the Space Shuttle side-hatch window for UV observations; a telescope optical coupling assembly (TOCA) that physically and optically couples the ICCD camera to the telescope, and which can hold up to three imaging filters in the optical path; a filter caddy that holds the filters and lenses used in the TOCA; and associated power and data cables. The data from the ICCD camera is an analog video signal that is recorded on-board the Shuttle with a portable camcorder, and which can be downlinked from the Shuttle to the ground for real-time assessment. The photo at left shows a schematic of the SWUIS TSM hardware components configured for Space Shuttle flights. Soon, we plan to add a new mode and new capabilities to SWUIS with a spectrograph now in design. The telescope (see photo at left), built by Questar Corporation, is a custom 7-inch (18 cm) diameter Maksutov-Cassegrain design ruggedized for space flight use. It incorporates a UV transmissive front end corrector lens made of magnesium fluoride, and mirror optical coatings composed of aluminum overcoated with magnesium fluoride for enhanced sensitivity at UV/VIS/IR wavelengths (200--1000 nm). The telescope incorporates a small 6x30 mm finder telescope which allows the Shuttle mission specialist to make fine pointing adjustments to the telescope during target acquisition. The telescope is hard mounted to the side-hatch window in the Shuttle mid-deck area via a custom two-axis mounting bracket with manual slow motion controls for fine-pointing. A light shield made of Pyrell foam is placed between the window and the telescope to block unwanted cabin light from entering the telescope. The telescope and mounting bracket weigh approximately 30 lbs. We have available a variety of ruggedized ICCD cameras, built by Xybion Inc., that can fly as part of the SWUIS hardware complement, and which are sensitive to UV, VIS, and near-IR (NIR) wavelengths. The wavelength sensitivity of each ICCD camera is determined by the type of photocathode material used in the camera's design. The UV/VIS version utilizes a Generation II photocathode with a sensitivity in the 180--820 nm wavelength range. A second VIS version utilizes an extended blue Generation III photocathode with high sensitivity between 450 and 910 nm. The NIR version has high sensitivity between 600 and 1000 nm. The output of the ICCD camera is a standard RS-170 video signal at an interlaced frame rate of 60 Hz with 370 lines of horizontal resolution. The camera weighs 2.75 pounds and draws about 5 Watts. The TOCA is a mechanical interface between the telescope and the ICCD camera. It is designed to hold both imaging filters and lenses. The effective focal length of the SWUIS TSM system can be varied between 105 and 257 cm for a field-of-view range between 0.3 and 0.6 deg (full cone). The electronics that control the ICCD camera were custom built at SwRI. The Power Interface Box (PIB) provides power conditioning from the Space Shuttle Orbiter's video interface unit to the ICCD camera. The PIB also has manual adjustment controls of the ICCD camera's internal sensitivity (gain) and video output signal. The video output signal is buffered by the PIB to allow multiple data paths to camcorders, monitors, and to the Shuttle's video downlink system. 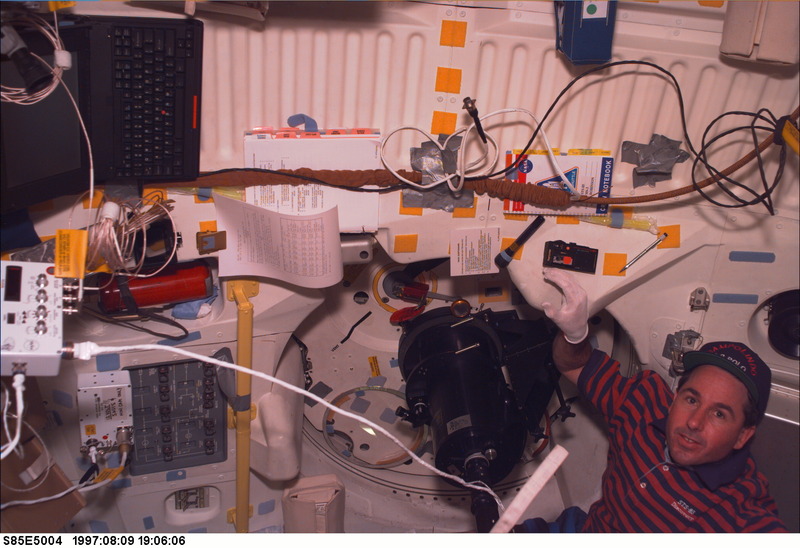 During Space Shuttle missions, SWUIS data is recorded on board with a portable camcorder, and can also be sent to the ground via satellite link. SWUIS TSM mode provides astronomers and planetary scientists with a small but highly capable space telescope. Although far less sensitive than the Hubble Space Telescope, SWUIS has its own advantages. These include a far wider field of view, and the capability to study objects that are much closer to the Sun, such as the inner planets, and comets. The SWUIS CSM configuration is very similar to the TSM mode except the ICCD camera is used with a UV transmissive wide-field lens, instead of the main telescope. A mini-TOCA is used to hold filter combinations. The CSM can be mounted to any of the Shuttle windows including the side-hatch window, and the nine flight deck windows using a Bogan bracket camera mount. The wide-field lens assembly provides a FOV of approximately 12.5 deg (full cone). SWUIS CSM allows us to extended SWUIS capabilities into studies of the Earth's atmosphere, aurora, and the ozone layer; it's also useful for certain types of stellar astronomy. When in mid-1996 NASA announced its selection of payloads to study comet Hale-Bopp, the roster included a host of suborbital rocket missions, high-altitude aircraft flights, and one Shuttle experiment: SWUIS. 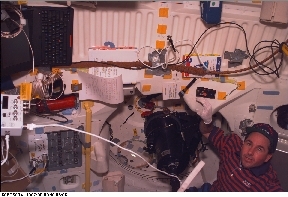 Between that point and the June 1997 delivery of SWUIS to JSC before launch, we (1) designed, fabricated, and certified all of the flight interface hardware for SWUIS to fly on Shuttle; (2) completed all of the pre-mission Shuttle crew training; (3) developed all of the necessary documentation, safety certification, and hardware tests required to fly on Shuttle; and (4) calibrated the instrument both in the lab and in the field, using star fields and comet Hale-Bopp itself. Left: Hale-Bopp, 1997 March 19, blue filter, 40s of processed exposure time from a longer imaging session. Right: same image after digital unsharp mask subtracted. Dr. David Slater looks on as Mission Specialists Steve Robinson (left) and Jan Davis (right) inspect a fit check check of the SwUIS telescope in their Shuttle Orbiter at KSC, June 1997. After instrument delivery, we prepared the ground software needed for quick-look image quality analysis, and participated in mission simulations in Houston. Simultaneously, PI Alan Stern flew with an infra-red, wide-field version of SWUIS at 51,000 ft in NASA's WB-57 (see photo above) and obtained 45 minutes of data to characterize SWUIS IR performance at altitude. 9 Aug 1997. A portrait in the shuttle middeck of SWUIS and MS Robinson after a job well done! The mission we were assigned to was STS-85, which was launched on August 8, 1997 (see photo above). The mission, flown by the orbiter Discovery, lasted ten days. Some of the other payloads flown were a Japanese robotic arm, a deployable satellite with an IR telescope, the TAS technology applications payload, and a Hitchhiker payload called UVSTAR. SWUIS was operated on nine separate orbits, one more than had been planned pre-flight. The instrument performed well, and some nine hours of data were recorded (see Table 1 below). The instrument performed flawlessly, recording over 430,000 images of the comet in a variety of key emission bands. The data collected by SWUIS (see images below) provide the only wide-field UV images of Hale-Bopp, the first-ever UV time-lapse series of a comet, tens of thousands of images of broad band UV and OH fluorescence, as well as images in the visible and the near-UV using the standard, NASA-provided set of Hale-Bopp Watch filters were collected. Comparative data on Hale-Bopp's coma and tail morphology on three fundamental timescales are contained in these data: minutes (i.e., during a given filter image sequence), hours (i.e., on successive orbits on a given date), and days (i.e., over the 6 day span of the dataset). Further, the SWUIS dataset contains the only OH (and therefore water-production) rate data that we are aware of prior to the resumption of HST observations in September 1997, the only UV dust/continuum images of the whole molecular coma, and high-frequency photometry of Hale-Bopp making it possible to search for pulsations and other phenomena of scientific interest. 9 Aug 1997: Two computer enhanced versions of a portion of the same visible+UV acquisition sequence. Integration time of 83.3s. 9 Aug 1997: A false-color 23s integration of comet Hale-Bopp obtained during the aquisition for Discovery's 2nd orbit of SWUIS observations. 12 Aug 1997: A false-color 40s integration of comet Hale-Bopp obtained during the aquisition for Discovery's 3rd orbit of SWUIS observations. SWUIS is scheduled to fly its second Space Shuttle mission in July 1999 aboard the Columbia Orbiter during STS-93. This mission will focus on obtaining ultraviolet imagery of an array of planetary and astrophysical targets. The specific objectives of SWUIS during this flight are to obtain: (i) the mid-UV albedo of Mercury for the first time and to search for spatial variations across the planet; (ii) mid-UV dynamic movies of the upper atmospheres of Venus and Jupiter; (iii) to establish the morphological appearance and phase curve of the Moon in the mid-UV for the first time; (iv) to search for Vulcanoids, a putative population of small, asteroid-like bodies residing interior to Mercury's orbit; and (v) to obtain mid-UV dynamic movies of the airglow along the earth's limb (in CSM). For the third SWUIS flight slated for 2000 or 2001, we are planning to add a new capability to the SWUIS experiment: a spectrograph that will attach to the SWUIS telescope. This spectrograph will allow SWUIS to pursue mid-UV spectroscopy of the inferior planets (Mercury and Venus) something that no other facility presently can offer. The spectrograph will also provide a valuable capability for cometary and asteroidal studies in the mid-UV as well as the VIS and NIR wavelengths. This new spectrograph, which is being designed and built at SwRI with NASA funding, will have a wavelength coverage that spans the mid-UV from 200 nm out to NIR wavelengths beyond 1100 nm. It will allow us to record the spectrum from astronomical targets with moderately high spectral resolution (approximately 0.1--0.5 nm). The spectrum will be recorded by the Xybion ICCD camera (or equivalent detector) which will attach to the focal plane end of the spectrograph. The ICCD camera will be able to sample approximately 23.0 nm of spectral bandpass during any single observation. The grating can be manually rotated to change the bandpass anywhere within the 200--1100 nm wavelength coverage of the instrument. With these new capabilities, SWUIS will become a versatile tool indeed. This unique facility has grown from a camera flying aboard high altitude aircraft to a sophisticated and highly reconfigurable astronomical and Earth-remote sensing laboratory, which has applications ranging from studies of celestial objects, to the ozone hole, to space debris. With so much going for it, we are hopeful that SWUIS will be selected for flight as a remote sensing facility aboard the International Space Station when it becomes operational. SWUIS's maiden flight aboard the Shuttle last summer was a wonderful capstone to the first phase of this project. Now, with two more flights on the books, and plans for more being proposed, we are entering a vigorous operational phase for this versatile space observatory. Already, we see on the horizon the possibility of using SWUIS to detect and track space debris that is a hazard to the Space Station and Space Shuttle, the expansion of SWUIS capabilities into the infrared, and the application of SWUIS to a wide variety of terrestrial applications, including lightning, aurora, and ozone studies. In future years we expect to see more SWUIS flight on the Shuttle, an expanding array of airborne applications (see sidebar), and the potential to make SWUIS a Space Station facility for remote sensing. None of this would have been possible without the kindling that Internal Research funding provided at the project's outset.